I sometimes wonder how some of you can get through books so quickly. I’m coming to suspect I am a Slow Reader. It could also be that I have a 2-year-old who does not like me reading on her watch (though she ought to be counterbalanced by a job that lets me read, sometimes, 7h a day), or that for the second time this summer, I am embroiled in a book that exceeds 700 pages. Nevertheless, my “want to read” pile is growing much, much more quickly than my “read” pile. We have a rule in my house: you read 5 books off the shelf before you get to buy one more. My history with this rule is poor, but lately has been improving. It helps that I’ve moved, and in rearranging my library I’ve rediscovered many delicious reads I’d forgotten I’d bought. But the list of books I want to buy is growing unwieldy. Has anyone else around here noticed that Canada houses a really disproportionate number of the world’s most excellent speculative writers? Guy Gavriel Kay, Charles DeLint, Nalo Hopkinson – and Robert Charles Wilson? Wilson’s latest, Julian Comstock: A Story of 22nd-Century America, has racked up more awards and kudos than I could possibly list here – but watch to see who wins this weekend’s Hugo [ETA – it didn’t win, but I’m still excited!]. I talked myself into skipping this one in cloth, but now that it’s out in trade format, I’m twitching impatiently. My heart always has room for another work of post-apocalyptic steampunk social commentary! Three things made this book drool-worthy for me: 1) NYRB publishes beautiful, well-made books of great literary value and somehow, I don’t own a single one… yet. 2) Michael Chabon is in the small club of Authors Who Can Do No Wrong as far as I’m concerned – and if he says this book is good, I believe him! 3) I’m an unashamed devotee of historical fiction – and, come on, Vikings! I had something like zero interest in this book until recently. Steven Beattie’s assessment that “For Moore, language has always been more important than plot,” killed any enthusiasm I might have had right off the bat. Then Salty Ink featured it in its “Atlantic Canada Reads” competition. Of all the awards to pay heed to, sure, this one was obscure. But the recommendation was borne out by the Booker Prize panel, who longlisted it for the prize this fall. Kudos flooded in then, and suddenly, over a year after it was released, everyone was claiming to have loved this book all along. Okay, okay, you win! Let’s see what language has done here. I look forward to being wrong on this one. Meanwhile, Don Gillmor’s Kanata has been exciting for me right from day one. Have I mentioned I adore Don Gillmor? And historical fiction? And Canada? Unlike some, I don’t feel Canadian Literature is groaning under the weight of ponderous works of collective nostalgia: I rather feel that we still lack a good national historical imagination and it shows in our increasingly vacuous sense of context. Most Canadians don’t know their history and I feel it’s in no small part because we don’t have enough memorable stories about it. 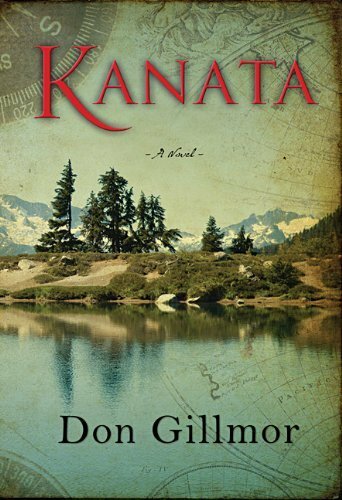 Will Kanata help flush out that body of work? I can’t wait to find out. Even though I haven’t read this books, I’ve still referenced it and quoted it in dozens of conversations over the last half-year – one of the advantages of working in a bookstore, I guess. I can skim and sample enough to talk about something without actually reading it. But this one demands a full read-through. The notion of “cheap” is one of my pet peeves; rooted in a bit of a bourgeois attitude that it isn’t cool to speak of or care about prices, and exacerbated by my close involvement in an industry which is suffering in large part because people would rather save $2.50 than help support an important cultural industry. Of course it’s cheaper to buy books from Amazon than your local independent – but at what cost? I am going to read this book and then, I hope you will too.